A 76 year old man , previously fit and well, had mown the lawn the previous afternoon. The following morning he got up complaining of low back pain and stiffness which he put down to the previous days exertion. However, over the following two weeks he felt progressively less well with poor appetite, more generalised muscle stiffness and pain throughout his shoulders, buttocks and thighs. He was particularly troubled first thing in the morning and took a long time to dress. His sleep was disturbed with pain and he had difficulty in turning in bed. He was starting to loose weight and his family were very concerned about him. A 23 year old woman visited her GP with a 12 week history of swollen tender knuckles and some shoulder stiffness. Some initial blood tests showed high levels of inflammation in the blood and some further tests suggested rheumatoid arthritis. This patient was referred to the Edinburgh Rheumatology Practice and was seen the same week. Some further bloods and x rays were taken and the diagnosis of rheumatoid arthritis was confirmed. The optimal treatment regimes were discussed with the patient and her husband and, within a week, she was started on a disease modifying anti-rheumatic drug (DMARD) and given some steroid injections, which had a rapidly beneficial effect. A long planned golfing holiday abroad was curtailed for one 55 yr old man after he developed an excruciatingly painful and swollen left wrist. He had past history of blood pressure problems and had been started on a water tablet by GP before the holiday. Immediately on his return he visited his GP who contacted the Practice. We were able to offer appointment the same day. He had a joint aspiration (a needle was placed into the joint under local anaesthetic and a specimen of joint fluid was obtained for special examination). This confirmed the presence of uric acid crystals in the joint fluid. He was given treatment which rapidly improved his pain and in conjunction with his GP his blood pressure treatment was altered. Comment: An acutely hot swollen joint is a medical emergency and requires prompt investigation to exclude a joint infection.Rapid access is one of the corner stones of the Edinburgh Rheumatology Practice. 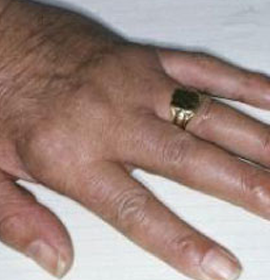 Swollen joints in Rheumatoid Arthritis.